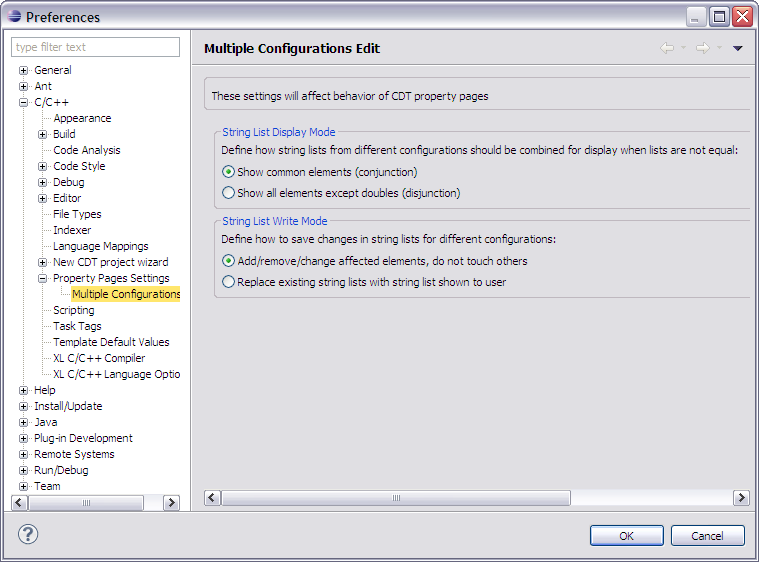 Use the Multi-Configuration Edit preference panel to simultaneously edit properties for multiple project configurations. Its possible to select one or more configurations for editing. But, then we deal with string list property values, it is not obvious how to concatenate them, if they differ. Conjunction shows common elements only, so if 1st configuration has value <A, B, C> and 2nd configuration has <B, C, D>, <B, C> will be shown. Disjunction shows all existing elements except doubles, so if 1st configuration has value <A, B, C> and 2nd configuration has <B, C, D>, <A, B, C, D> will be shown. Note that Display mode can be changed directly on each tab which deals with string lists. Result is immediate: data on the tab is refreshed according to selected mode. Modify mode adds, changes or removes elements affected by user's actions. Elements which were not touched by user are left unchanged. Example: cfg1 has <A, B, C>; cfg2 has <B, C, D>. User removed B and added F.
Result: cfg1 has <A, C, F>; cfg2 has <C, D, F>. Replace mode puts currently visible elements to all configurations. Old contents will be lost. Visible list depends of Display mode: <B, C> or <A, B, C, D>. Result: both cfgs will contain either <C, F> or <A, C, D, F> depending of Display mode. Note that Write mode can be changed directly on each tab which deals with string lists.